Brightens & Neutralizes Unwanted Yellow Tones. Matrix Total Results So Silver Shampoo 33.8oz ( NEW PACKAGING ) Free 2-Day Ship! 5 out of 5 stars - Matrix Total Results So Silver Shampoo 33.8oz ( NEW PACKAGING ) Free 2-Day Ship! 14 product ratings14 product ratings - Matrix Total Results So Silver Shampoo 33.8oz ( NEW PACKAGING ) Free 2-Day Ship! This product must not be used for dyeing the eyelashes or eyebrows; to do so may cause blindness. Keep out of reach of children. Wear disposable gloves when applying. Wash hands thoroughly after use. 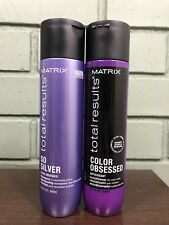 Matrix Total Results So Silver Color Obsessed Shampoo & Conditioner 10.1oz DUO! Enrich your silver strands with Discover Matrix Color Obsessed So Silver previously known as Color Care So Silver. Matrix Total Results Color Obsessed So Silver clarifying shampoo cleanses and neutralizes unwanted brassy warmth and eliminates dull, yellow tones. 5 out of 5 stars - Matrix Total Results So Silver Color Obsessed Shampoo & Conditioner 10.1oz DUO! 37 product ratings37 product ratings - Matrix Total Results So Silver Color Obsessed Shampoo & Conditioner 10.1oz DUO! Matrix Total Results So Silver Shampoo, 10.1 oz (Pack of 2). Condition is New. Shipped with USPS Priority Mail. Keep color vibrant! Get ready for vibrant color with Color Obsessed. Now all you need to do is color outside the lines! Neutralizes brassy warmth and eliminates dull, yellow tones. Shampoo 33.8 oz. Conditioner 10.1 oz. NO INTERNATIONAL! It neutralizes unwanted brassy warmth. Eliminates dull, yellow tones. Illuminates highlights on blondes. 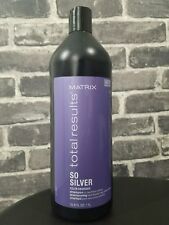 Matrix Total Results So Silver Shampoo 33.8oz - NEW & FRESH! Same Day Shipping! Matrix Total Results So Silver Shampoo 33.8oz - NEW & FRESH! Matrix Total Results Color Obsessed So Silver will neutralize unwanted brassy warmth and will eliminate dull, yellowish tones. It illuminates highlights on blondes and adds brightness to gray and white hair. 5 out of 5 stars - Matrix Total Results So Silver Shampoo 33.8oz - NEW & FRESH! Same Day Shipping! 14 product ratings14 product ratings - Matrix Total Results So Silver Shampoo 33.8oz - NEW & FRESH! Same Day Shipping! Matrix Total Results Color Obsessed So Silver will neutralize unwanted brassy warmth and will eliminate dull, yellowish tones. It illuminates highlights on blondes and adds brightness to gray and white hair. 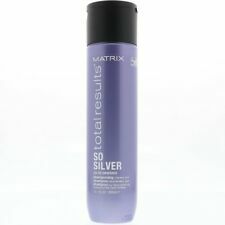 Matrix Total Results So Silver Shampoo 33.8 Oz ( NEW PACKAGING ) . Condition is New. Shipped with USPS Priority Mail Flat Rate Envelope. We value your opinion and will use your suggestions to improve our service. About the product. Size 33.8 Fl oz / 1Liter. Matrix Total Results Color Obsessed So Silver Toning Shampoo enhances the brightness of grey, white or blonde color-treated hair. And, neutralize unappealing brassiness and dull, yellow tones with the gentle cleanser. Shampoo 10.1 oz. Conditioner 10.1 oz. NO INTERNATIONAL! Matrix Color Obsessed So Silver enriches your silver strands. Previously known as Color Care So Silver, Matrix Total Results Color Obsessed So Silver is a professional salon clarifying shampoo that cleanses and neutralizes unwanted brassy warmth and eliminates dull, yellow tones. Matrix So Silver Shampoo 10.1 Fl oz. Condition is New. Shipped with USPS Priority Mail. Matrix Total Results Color Obsessed So Silver Shampoo 10.1oz (2 PACK) NEW! matrix total results so silver shampoo Blonde Gray Or white Hair Purple Shampoo. Condition is New. Shampoo to neutralize yellow. Shipped with USPS Priority Mail. Matrix Total Results Color Obsessed So Silver Shampoo is a rich, creamy violet lather that neutralizes brassy warmth and correct yellow tones on blonde and gray hair. It conditions a it gently cleanses. 5 out of 5 stars - Matrix Total Results Color Obsessed So Silver Shampoo 10.1oz (2 PACK) NEW! 37 product ratings37 product ratings - Matrix Total Results Color Obsessed So Silver Shampoo 10.1oz (2 PACK) NEW! 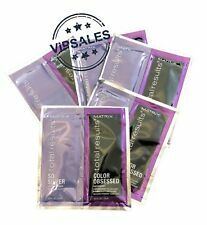 Matrix Total Results Color Obsessed So Silver Shampoo - 10.1oz Each - 2 PACK!! Shampoo to neutralize yellow in the hair. Shampoo 33.8 oz. Conditioner 33.8 oz. NO INTERNATIONAL! Matrix Total Results So Silver Color Obsessed Shampoo 10.1oz Neutralize Yellow. Condition is New. Shipped with USPS First Class Package. PRODUCT TYPE- SHAMPOO TO NEUTRALIZE YELLOW. ITEM INFO- Matrix Color Obsessed So Silver enriches your silver strands. Previously known as Color Care So Silver, Matrix Total Results Color Obsessed So Silver is a professional salon clarifying shampoo that cleanses and neutralizes unwanted brassy warmth and eliminates dull, yellow tones. Color Obsessed So Silver Purple Shampoo enriches your silver strands. Previously known as Color Care So Silver, Total Results Color Obsessed So Silver is a professional salon clarifying shampoo that cleanses and neutralizes unwanted brassy warmth and eliminates dull, yellow tones. Matrix Total Results So Silver Color Obsessed Shampoo 33.8 fl. & Color Obsessed Conditioner 33.8 fl. You will receive a 10.1 fl. 2-Shampoo 33.8 oz. NO INTERNATIONAL! NEW MATRIX Total Results SO SILVER Color Obsessed Shampoo Neutralize 10.1 fl.oz. 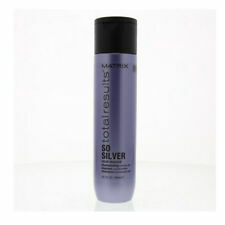 Matrix Total Results So Silver Shampoo, 33.8 Ounce SPECIAL! About the product. Illuminates highlights on blondes. 5 out of 5 stars - Matrix Total Results So Silver Shampoo, 33.8 Ounce SPECIAL! 14 product ratings14 product ratings - Matrix Total Results So Silver Shampoo, 33.8 Ounce SPECIAL! Matrix Total Results Color Obsessed So Silver Shampoo 10.1oz - NEW & FRESH!